It’s the most wonderful time of the year! 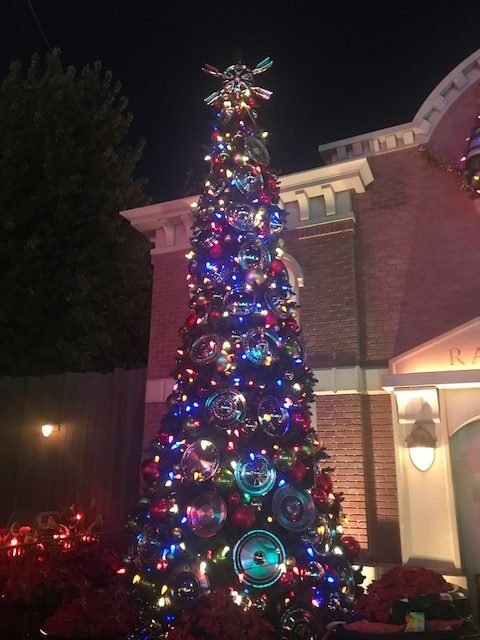 That’s right, it’s Christmas time which means the theme parks are going all out to bring you a fun filled holiday season. 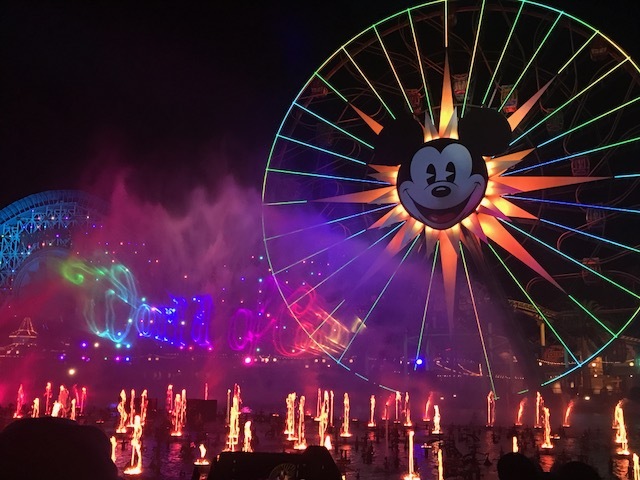 We thought it would be a good idea to give you the breakdown on what you should attend at Disneyland and Disney’s California Adventure. 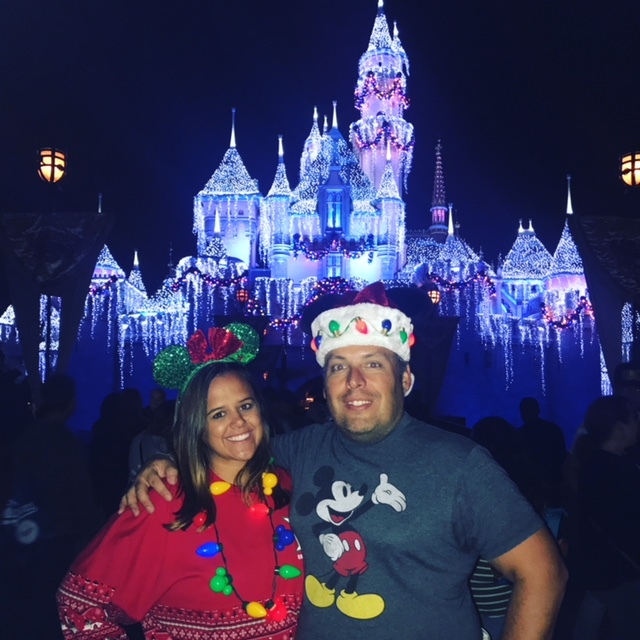 This was our first trip to Disneyland for the holidays and they without a doubt hit it out of the park! 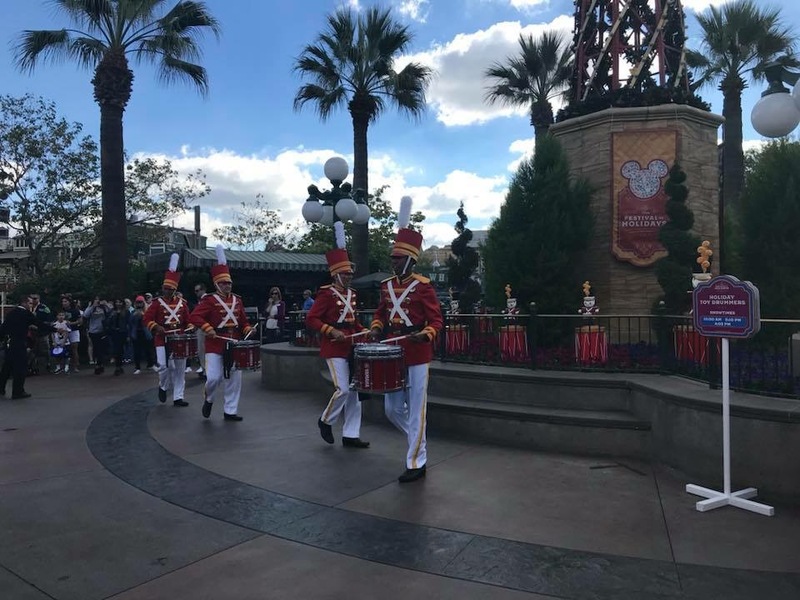 Disclaimer – the candy canes did not make our list because they were not available yet when we were there, but we are told they are a must do. 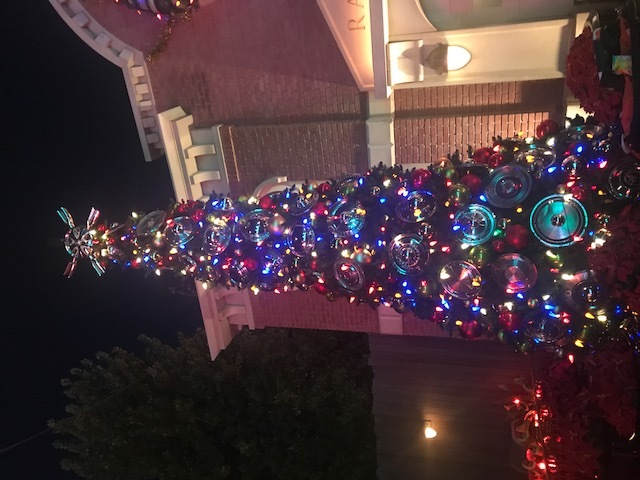 Make sure to keep coming back the next few days for more Top 5 Tips for the Holidays at Universal Orlando Resorts and Walt Disney World. 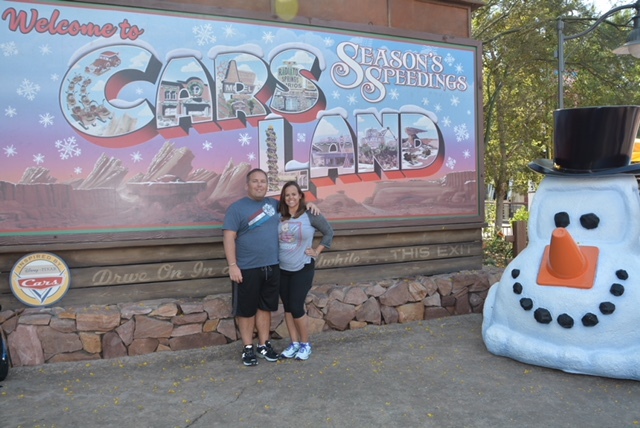 The Christmas decor is absolutely adorable in Cars Land. Not only does it look great during the day, but at night with all the lights its stunning. Even a few rides are retimed for the holiday season. There’s Luigi’s Joy to the Whirl and Mater’s Jingle Jamboree. Make sure to keep your eyes peeled for Mater’s Meet and Greet. He is decked out in his Christmas gear, and we kept missing him. Before watching this we did not know what to expect. We had pictured in our minds that these toy soldiers would be in a full on costume including a mask. We were very surprised when they came out and were face characters. At first we were disappointed by this, but once they began performing their facial expressions helped make the show! These are some talented guys that you should take 10 minutes out of your day to watch. Not only do they play the drums, but they dance and do tricks such as throwing their sticks back and forth in the air! 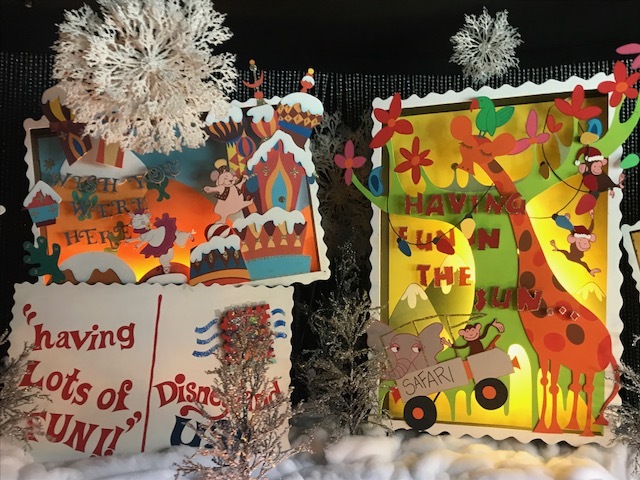 We were excited for the Nighttime holiday shows at Disneyland and Disney’s California Adventure because we enjoy the regular shows so much. Plus you know we may be a little infatuated with all nighttime spectaculars thanks to our rankings of the Walt Disney World shows. Disneyland did not let us down. We made the mistake of not getting a spot early enough for the Disneyland fireworks, so we did have an obstructed view of the projections on Sleeping Beauty’s castle. 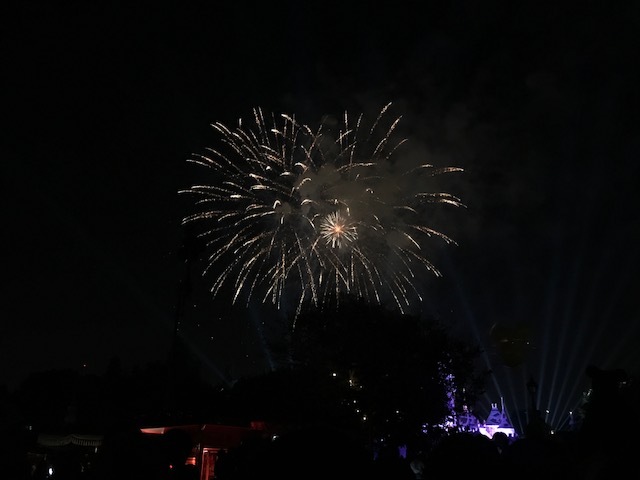 We loved the fireworks though and the soundtrack. Don’t make the same mistake we did, get there an hour early for a better spot! Unfortunately with our limited days in the parks we did not get to see World of Color holiday, but from previous experience this is also a show to not be missed. We did watch the original World of Color though and for the first time we sat in the splash zone. We highly recommend this spot. You do not get splashed, just a light mist throughout the show, which is well worth it for the spectacular view! This was on our must dos months before leaving. We were prepared to wait hours to ride this based on what we had been told from some of our fellow casual runners. However, this year they added fast pass to this attraction. We were at the park on opening day of this attraction and scored a fast pass for first thing that morning. Unfortunately the ride did not open as planned that morning and was delayed for several hours. We were able to come back later in the day and use our fast pass, but we had to wait about half an hour as the fast pass line was pretty backed up. Fast pass is highly recommend as the standby line was over 90 minutes the entire day. 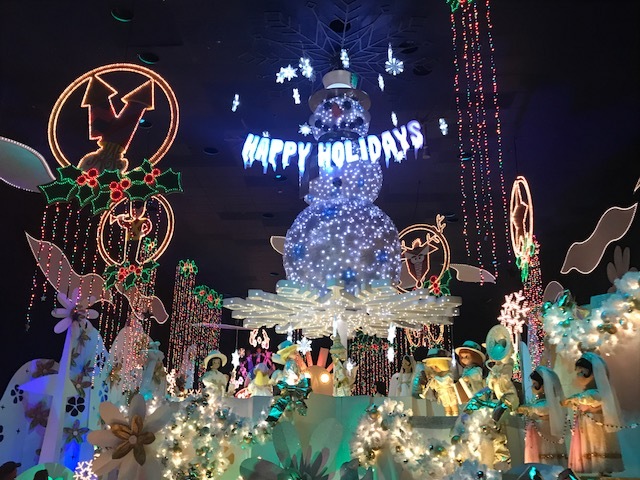 Not only is the ride completely laid over in decorations, but the outside is decked out in lights. Make sure to grab plenty of pictures. 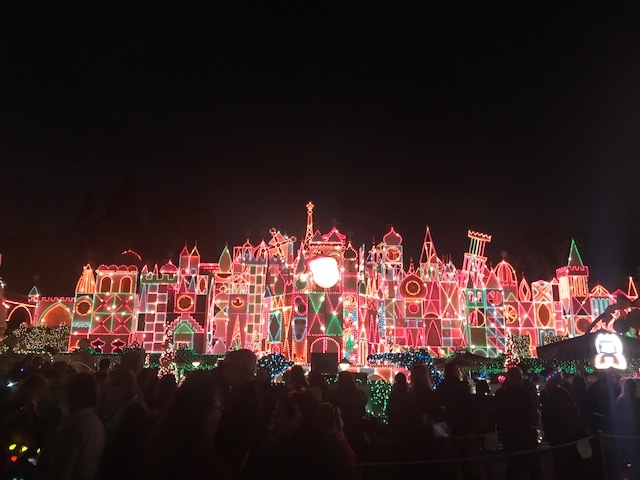 We found the lights on it’s a small world more impressive than on Sleeping Beauty’s castle! They do leave an area clear in front of the ride so people can get pictures, however there is no photo pass photographer to take them for you. 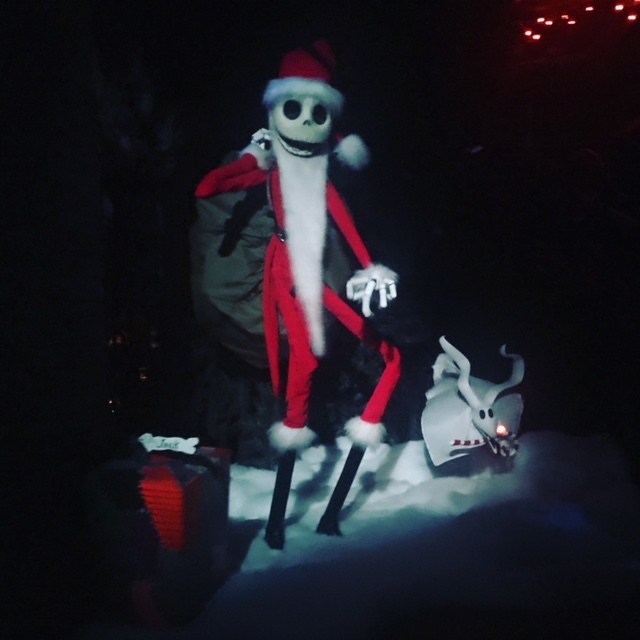 Hands down if you’re only going to do one thing this holiday season at Disneyland riding Haunted Mansion with the Nightmare Before Christmas layover is it! It is a completely different ride than if you were to ride it from January thru September. The amount of work that goes into flipping this ride over is beyond impressive and we just wish Walt Disney World would do the same. Everyone in our group loved this ride and we rode it multiple times each day we were there. This ride is not open during extra magic hours (much to our dismay) so right before the park open we would make our way toward the ride to be the first in line! You don’t like the Nightmare Before Christmas you say? 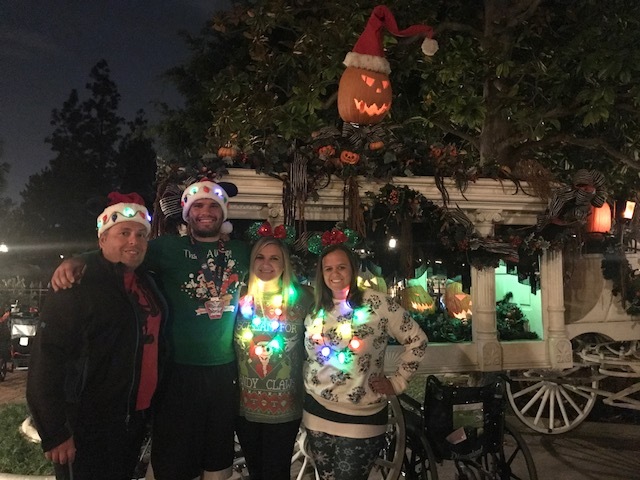 Well that’s okay because neither does Mike and he found this to be his favorite part of the holiday season at Disneyland. Candace absolutely loved it, especially everytime Zero appeared. She may already be planning a trip next year just for this ride. Mike would greatly appreciate it if Florida got on board with this layover! Also make sure you pick up all the extra Nightmare Before Christmas merchandise that is out for the holiday season. The Sally Ears are a must have for diehard fans.